I have to ask myself what is this fascination of tearing apart computers when I have "a cold". In this case, The Cold turned out to be The Flu. It wasn't fun. I'm at about day 5 and this is the first day that I'm clear enough to sit down and write. The back story goes that I was handed a wee little laptop. Thinkpad X201 if you are following along. It's a pocket rocket of a machine, i7 processor, 8GB of memory, 500 GB mechanical hard drive. All of that was crammed into a 12 inch case. It predates the whole "Ultrabook" computer thing where people started building machines that were thin, light, and powerful. The Mac Book Air is a prime example of what they tried to emulate. I think they got the power right. I was told "I have data on this that I need recovered, then see what you can do with it, it's got a heat problem". What Thinkpad doesn't? 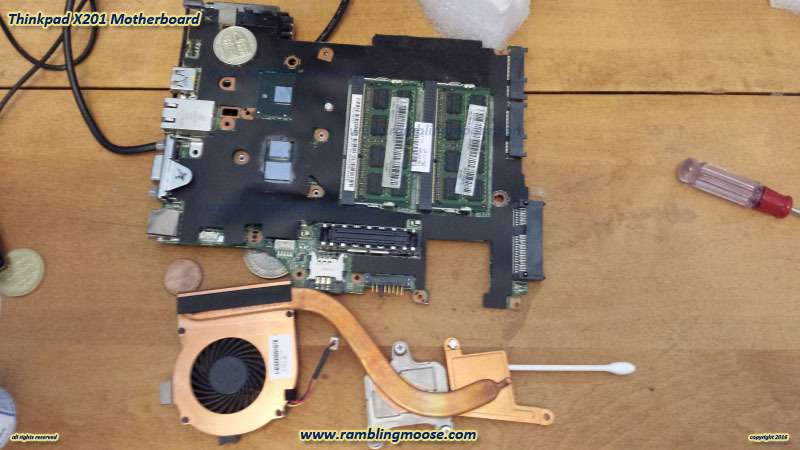 Lenovo switched to a heat sink compound a while back that has the consistency of Silly Putty or dried tub caulk. That is to say that it dries out and flakes away. I found that out later when I opened the machine and had little grey bits of goo fall out onto the table. What I did was to recover the data, there wasn't much because the machine was not trusted, and then reload it. It came with Windows 7 so I reinstalled that, then I made sure that Windows 10 would never get onto the machine by turning Windows Update to manual only and checked each update on the list to make sure it wasn't rumored to be either Windows 10 Related or Windows Telemetry. I don't like what Microsoft is doing to a once very stable operating system and neither should you. There is also a registry setting that will help keep that horrible pest off your computer, but if you have that little nag box sitting in your task bar you can be guaranteed that you will be "upgraded" to Windows 10 Home. No. Not on your best day. I am not allowing that. When I was chatting with someone he suggested I put it on a torture test and recommended Prime 95 which calculates prime numbers. It also turns any given machine into a furnace. I was typing in chat that it was playing well when "Black Screen". The processor hit 100C and turned off. Yes, as in Boiling Water Temperature. Processors these days tend to run 50C or cooler. 100C under load is going to shorten the life of the machine. It needed help. I found a series of videos, one that showed how to disassemble the machine so that the motherboard could be removed. The second one showed the reverse order how to reassemble it. By the time I had fully tore this little machine apart, I had nothing left in the case and a mother board on the table with the heat sink below it with a few random coins for size comparison. If you are curious, there's a game token, a penny, a UK Pound and a UK Two Pound coin. I ran that video in stop motion, and every time that the author removed a screw, I removed the same. It took me about 20 minutes to tear it down. The picture at the top is the result. The blue squares are the processors and the heat sink compound. They were cleaned with Rubbing Alcohol, and the lot was reassembled with the second video one screw at a time. So if it was so straightforward, why am I writing about it? So I have the info for later. Complete with the videos. Oh, make sure you have a little cup to put all those little screws into. There were two sizes and they have to be put back in the same holes. Luckily the video went "Large Screw" first, "Small Screw" Second. Good luck, Future Me if you have to tear it down. But after a week of beating it up, it's a great little laptop to go onto its owner if I can convince him to take it back! And if you are not "Future Me", the Standard Internet Warranty applies - this is at your own risk, if your following these instructions turn your laptop into a dragon that consumes you or starts a fire, or causes any sort of damage, you are on your own because I can't take any responsibility for that. Besides, I still have the flu.